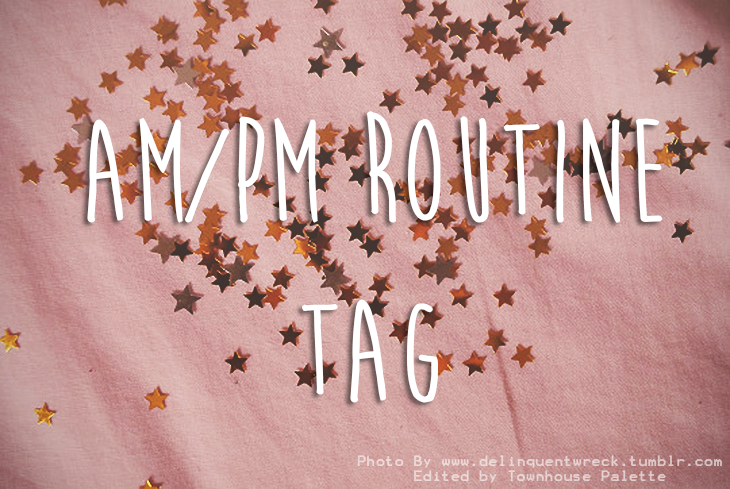 Today, I will be doing the AM/PM Tag. I originally saw this on The Celution (link) and told myself to do it, but then forgot, then saw it on the Like Neon Love (link) and had that 'Oh Yeah' moment. I usually wake up from an alarm or an urge to use the bathroom, no joke! After that, I wash my face. Recently, I have been using the Neutrogena Gentle Foaming Face Cleanser (link) following The Nature Republic Aloe Vera (link) as essence and The First Aid Beauty Ultra Repair Cream Intense Hydration (link). Same thing every day. One egg with spinach and mushrooms seasoned with salt and pepper made into an omelet. A slice of wheat toast with almond butter and, alternating between, cookie butter and Apricot Jam. Coffee with milk and Baileys Irish Cream Creamer. How long does it take you to get out the door? It is currently my summer vacation, so I have nowhere to go. However, it takes about 45 minutes to an hour. If I was still in high school I would be out within about 20-30 minutes. What is your go to makeup look on a fuss free morning? Some mascara, concealer, some powder, and a lip balm. Maybe some blush if I am looking extra ghosty. First I remove any makeup using my Garnier Micellar Water (link). Then I do my AM beauty routine finishing off with my Lioele Water Drop Sleeping Pack (link) or Daiso Hylauronic Acid Sleeping Pack (link). Snacktime! What is in the bowl? I don't really eat snacks in the evening, but I do enjoy a nice calming tea. My favorite tea at the moment is the Tazo Zen Green Tea. In a perfect world I would read a book, but in reality, I sit on my phone for like an hour. Cosy up! What are you wearing to sleep? Pajama pants and a comfy t-shirt. What are some things you must do before hitting the hay? I have to put my phone on do not disturb and just sleep. I am a pretty simple, fuss-free sleeper. Have you done this tag, let me know in the comments below!